diagnose, treat, cure, or prevent any disease. We are not responsible for any injury that may occur while using our tutorials or recipes. The use of the Graced Simplicity blog, and the content, is and should be used at your own risk. We want our readers to be able to trust the content found on Graced Simplicity™. We are not influenced by money, but by personal conviction and lifestyle. We do accept forms of advertising, paid insertions, sponsorship and other forms of cash compensation. On occasion products are sent in exchange for a review. 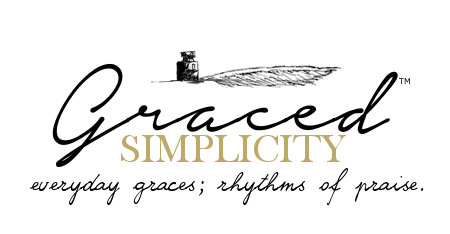 All opinions expressed on Graced Simplicity™ are solely our own, and we only suggest products or services that we ourselves believe would be helpful to you as the reader. Feel free to share posts via links, as well as paragraphs properly quoted and linked back to Graced Simplicity. Pinterest button photos are also welcomed to be pinned. Thank you, for respecting our copyrights, and for sharing! *Please, never copy full posts (only paragraphs that are properly linked back to our blog.) All articles and photos on this blog are © Copyrighted – All rights reserved – © Graced Simplicity™ . We enjoy engaging with our readers! We will try and do our best to respond, but are not always able to do so. Our comment policy does not tolerate, disrespectful, rude or plain mean, aggressive, swearing, vulgar, or spammy comments. These kind of comments will be deleted immediately. If you ever have questions or concerns, or just want to touch base – please send me a note. I love hearing from our readers!